Gratitude for all there is… One of This Grateful Now‘s biggest influences is Mother Earth, nature and the wellbeing of all. With this in mind I’d love to introduce to you more beautiful souls that really put their love and gratitude out there by creating sustainable, aware and earth-protecting businesses and lives. 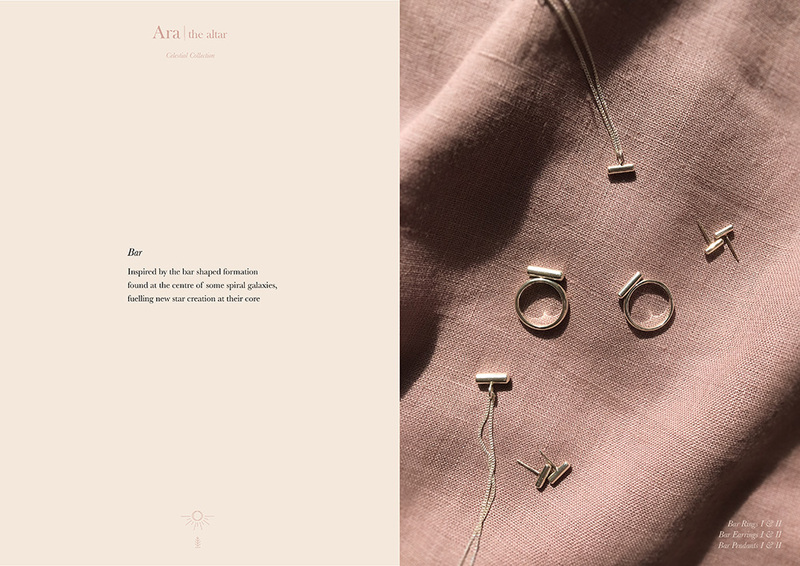 Someone that has been inspiring me immensely is Lauren, the founder of Ara the altar – who moved from a fashion background into creating her own stunning jewellery using only 100% recycled precious metal. The pieces are all truly meaningful and can really be treasured for a long time without harming the environment. I’m very grateful that Lauren has agreed to this interview for you. Hi Lauren, I’m so happy to have you here. Please tell us a little bit more about yourself and your brand Ara the altar. Hi Krissie, thank you for taking the time to get to know me and Ara the altar a little more. I’m from North West England where I manage my small, earth-aware business, Ara the altar. 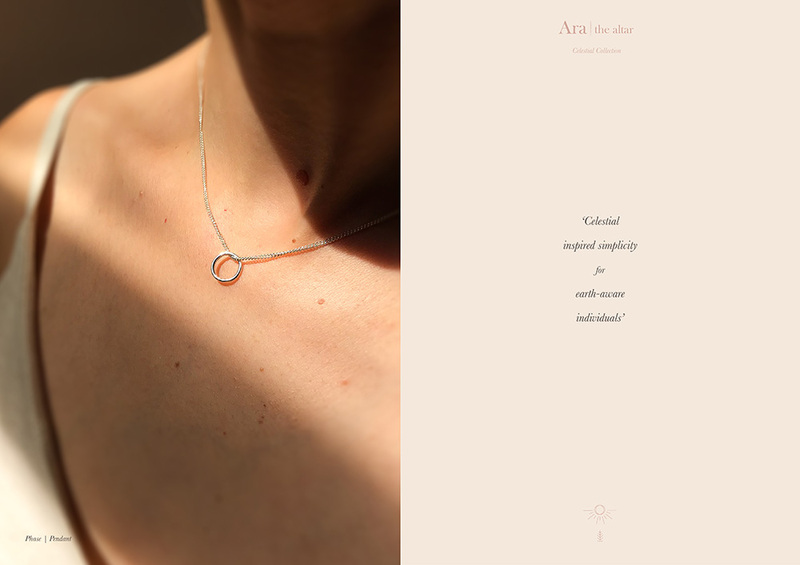 My aim is to tread lightly whilst creating eternal pieces that give the wearer a conscious connection with the beauty of our only planet. My career actually began in shoot production where I ended up working as a shoot producer in the fashion industry. Although at the time my chosen career path made complete sense when considering my background and interests, I often found myself unsettled by some aspects of the industry. In such a logistical role I also missed the hands on process of designing and creating that had always played such a big part in my life. In need of both a challenge and a creative outlet, I gave metalsmithing a go. I was captivated by the ability to create something so tangible and, over the years I built up a collection of tools to form my own workshop, developing skills and learning as I went. At the same time, as a consumer, I was developing more of an awareness of the detrimental impact associated with fast fashion and taking steps in my personal life to minimise my own impact on the environment. The more aware I became the more I felt dissatisfied with the limited options available to those of us looking to consume more consciously. I was drawn to the notion of slow fashion, designing, creating, and consuming responsibly, for longevity. In hand with this, what began as a creative hobby grew organically into Ara the altar. Your jewellery takes inspiration from astronomy, planets and nature. How has this inspiration come along? I take a lot of my influence from nature. When I’m not in the workshop I like to get outdoors as much as possible. I’m very much an advocate of taking the time to slow down and really appreciate the beauty in the natural world surrounding us. I feel the same way about astronomy and the notion that, ultimately, we are all made of star stuff. There is so much to absorb. The more I learn, the more awestruck I become by the beauty of celestial objects and the science behind them. I’m also inspired by the ancient world and its fascinating relationship with both nature and astronomy. 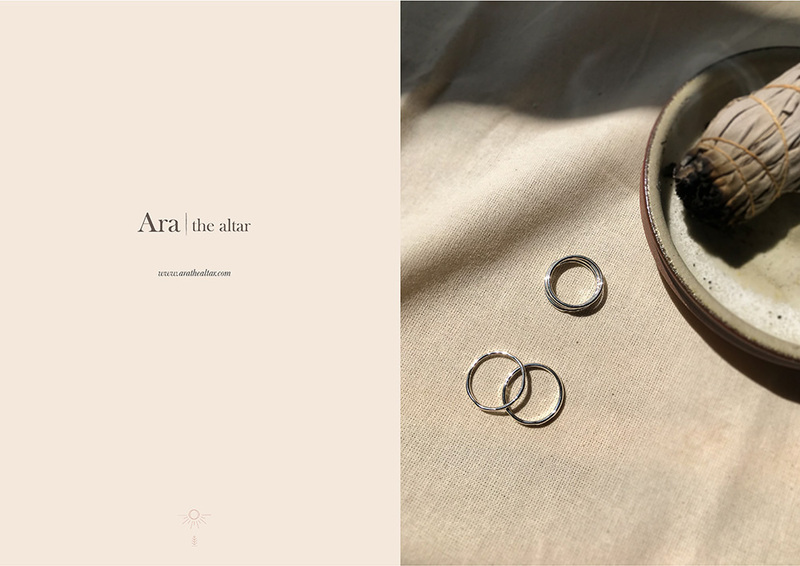 The brand itself was actually inspired by the ancient world’s perception of astronomy: Ara is a small constellation which, in Latin, means ‘the altar’ (and why I sometimes refer to Ara’s ‘offering’). Historically, Ara was depicted as an altar with rising incense or sacrificial offerings. My personal interpretation of this translated into the sourcing, creating and offering of beautiful, unique objects, for earth-aware individuals. 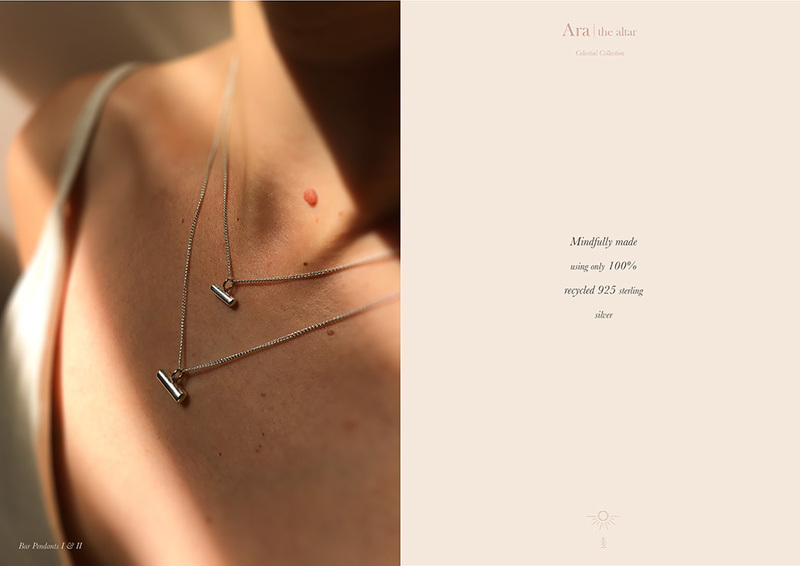 I love the definition of ‘timeless, minimal jewellery for earth-aware individuals’ and the thoughtful ethics of your brand that you mention on your website. Please tell us more about it. As I try to live my life in a way that is mindful of my impact on the earth, my own values concerning ethics and the environment are, naturally, woven throughout Ara the altar, influencing every business decision. 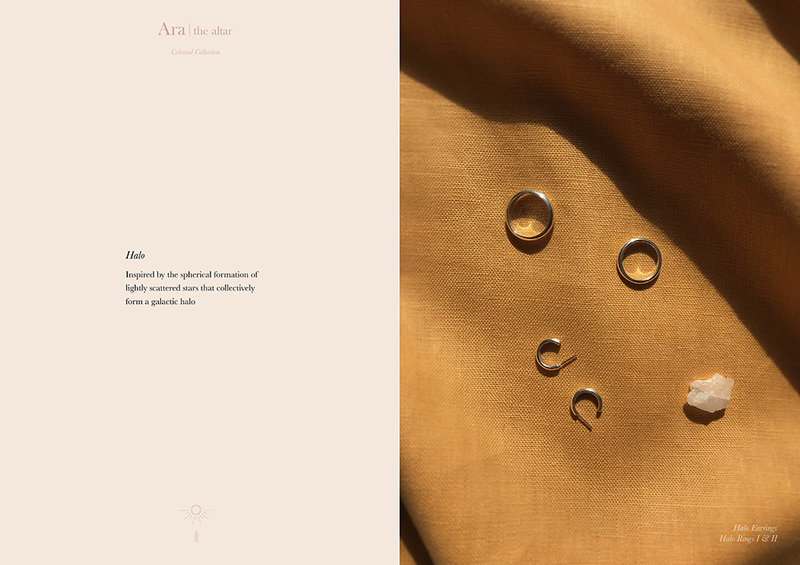 Ethics can have a different meaning for many of us but for me, and Ara the altar, it’s concerned with a transparent commitment to ethical practices that respect human, animal, and environmental welfare. 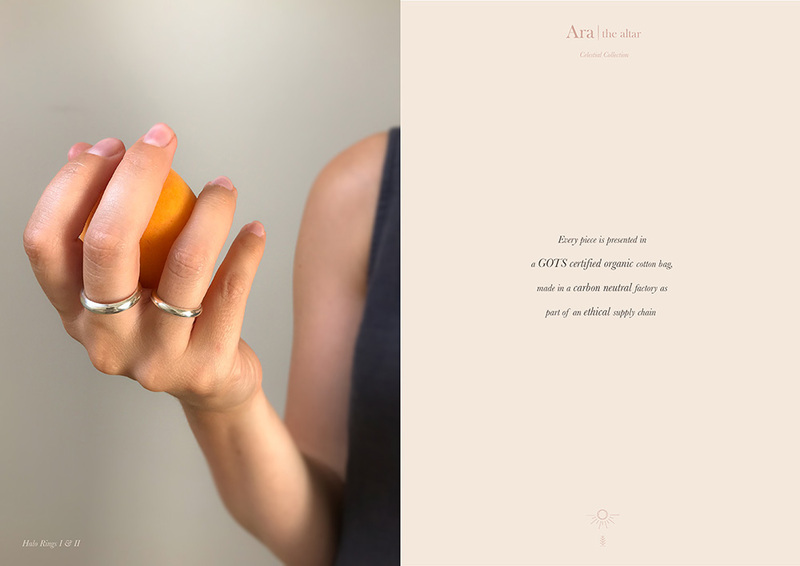 The slow concept that I adopt is respectful of people, animals and the planet throughout design, production and consumption, ultimately inviting consumers to buy better, less often. For example, it is of fundamental importance to me that Ara the altar does not support destructive practices that pull any more precious metal out of the earth. I choose to use only recycled solid silver and gold for my own production and also for any chains or findings that accompany my pieces. Here, my ethos is to reduce waste, environmental impact, and repurpose existing material into something beautiful, with a conscience. I make everything to order by hand and have an in-house recycling system that allows me to minimise and monitor waste. Every piece is then presented in a GOTS (Global Organic Textile Standard) certified, organic cotton drawstring bag, made in a carbon neutral factory as part of an ethical supply chain, and packaged using recycled, recyclable and biodegradable packaging materials. Put simply, I make careful considerations to minimise impact throughout the entire journey of an Ara the altar piece. Coming from a fashion background, has that pace and often environmental & ethical carelessness driven you to create something more conscious and aware? Being exposed to the lack of accountability throughout the fashion industry has undoubtedly had an impact on my own awareness. Working in the industry for a high profile British brand I was essentially caught in a relentless cycle of seasons, and became aware of what seemed like a societal encouragement to consume continually. Inspired by a conversation with a close friend who had developed a similar aversion to over consumption, I committed to a year without purchasing any clothing. I allowed myself a few slips for practical items (underwear, etc.) but, afterwards, I felt like I had realigned my ‘need’ to consume. Ever since, I think carefully about what I actually need and when I look for it I am more mindful about where and how it was made. I think this is why the notion of slow fashion makes so much sense to me. 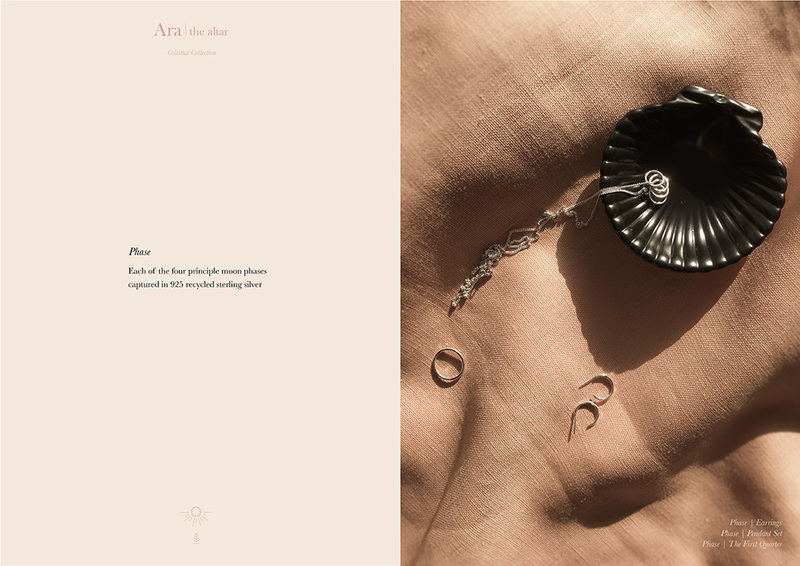 The realigned relationship I had found with consumption, alongside the creative focus I had found in my workshop, grew into Ara the altar, allowing me to offer conscientiously created pieces to those who, like me, were seeking reliable assurances. I think the concepts of slow(er) living and fashion, earth-awareness and gratitude go beautifully hand in hand. Do you feel there is a general change in how people want to live (and consume)? I completely agree and this is such an important topic. We are undoubtedly seeing a shift in consumer demand. As a society with an increasing awareness for the critical situation concerning the future of our planet there is a growing interest in the concept of slow or more sustainable living. I do think that, to a certain extent, there is a particular aesthetic association with living in a slower, more earth-aware way, one that, to many, may seem unattainable. I think it’s important to remember that there are no rules. It’s about connecting with a more purposeful and considered way of living, each of us within our own means. It’s not realistic to try and change all of the things that affect what we care about at once. For me personally, small actions cumulatively led to me living and consuming more in the way that I want to; and it isn’t over, I’m still trying and learning all the time. I think that allowing time for gratitude also helps us to understand what brings us joy. Ultimately, when bringing something in to my life I want it to serve a purpose, be it joy or a need, but I’ll try to do it with consideration and I think that’s the same for many of us. I do think we are on the cusp of a shift in priority for larger influential retailers and the establishment. Regardless, I believe that we as individuals can make every purchase a vote with our money for the world that we want, and the ways in which we want to live and consume. What lessons have you learnt along the way of creating your own brand? Have there been any particular challenges? As a very small independent company I manage all aspects of the business myself. In addition to designing and creating the jewellery I also do my own photography, graphic design, website management, marketing etc. Whilst I really enjoy turning my hand to many different creative practices it can be challenging to ensure the best distribution of my time and energy. I imagine this is something that many creative business owners can relate to. There are so many ideas galloping through my head but I have to reign myself in a little and be realistic when it comes to prioritisation. Thinking specifically about my earth-aware approach, one ongoing challenge is being able to offer all the creations that I would like to whilst adhering to my brand values. There are many ideas that I would love to explore but, as I allow myself to be confined by available resources, I can often spend longer researching and resourcing. For example, for a long time, as I could not find a suitable supplier for recycled chain or findings, Ara the altar offered only rings. When eventually I did I was able to create and release pieces that had been imagined long ago, finally enabling me to offer a full collection – my current Celestial collection (pictured). Whilst adhering to my values has its challenges and can impact on the pace at which I operate, refusing to compromise ensures the integrity of Ara the altar’s offering. How does a regular day of yours look like? I naturally wake up quite early, the first thing I do is always to make the bed. It seems like such an insignificant thing but, for me, it makes such a difference. When I’m pottering about getting ready, I do so in what feels like a calm, clear space which helps to relax and focus my mind. My next priority is always a brew – a cup of tea, loose leaf earl grey or green, and I always take time over my breakfast which is usually porridge and berries now that it’s getting cold enough. Introducing a little slowness in the mornings is really important to me, I’d much rather start the day earlier and allow myself time to ease into the day ahead. When I’m ready to start work I’ll usually remind myself of the day’s priorities by looking through my to-do list, as it’s electronic I can easily amend it as I go. In the workshop I also have a physical weekly planner to help me keep on top of various tasks and orders. Generally, I try and introduce as much structure to my day as I can by blocking out time for certain tasks, but due to the creative nature of my work, and with custom order enquires etc., I do have to allow for a certain degree of flexibility. You may notice that I play a lot with natural light in my photography too, so I’ve always got my eye on the weather forecast in case I need to utilise the sun beams and grab a few shots! I try and stick to working through emails and making orders in a morning. If I have orders to make, I’ll spend some time on the work bench and work my way through each, taking the time, care and attention that each piece deserves. When I’m on the bench I get in the habit of listening to a particular artist, at the moment it’s David Bowie and I’m alternating between Aladdin Sane and The Rise and Fall of Ziggy Stardust and the Spiders from Mars. When your work is something that you genuinely enjoy, it can be pretty easy to get carried away so I like to make time for a little pause in the middle of the day and sometimes get a change of scenery. In the afternoon I might portion out the time into design work for a new collection, any projects I might have on or working on some graphic design etc. At the moment, for example, I’m designing some cards to go with key styles from my Celestial collection as a keepsake for the recipient. At the end of a working day, I’ll revisit my to do list for the following day/week, reprioritising as necessary. I find this helps me keep on top of what’s ahead. Of course, both mornings and afternoons are always interspersed with plenty more tea! Do you have a ‘self care routine’? How do you bring slowness into your own life? I am a big believer in the importance of self care and introducing slowness into my life. My approach is pretty fluid: I try and weave self-care throughout my day, working or otherwise. For me, this could be as simple as lighting a candle or some incense whilst I work. Recently I’ve been burning the lavender and orange candle from Self Care Company and Roses from Essence and Alchemy. This is just a little habit I’ve gotten into, I find it such a simple way to bring some sensory awareness into my working space, allowing me to enjoy and focus on the task in hand. I do find that, when managing your own business, any breaks or down time can quickly get filled with checking Instagram, updating to-do lists or planning etc. so getting out for a walk or nipping to the post office really helps me get a bit of balance too. Thinking about more purposeful self-care, I try and make time for a little pilates or yoga practice most days. I use a cork yoga mat as I like that it is natural and tactile. I’m not strict with myself – my practice could be as little as 20 mins but just enough to get a good stretch. I find doing this in the evenings, after my working day, helps to create a little physical and mental space between work and my evening. What are your plans for Ara the altar in the near and further future? I have quite a few projects in the pipeline so my focus at the moment is prioritising what should come next! In the first instance, I am really excited about a few new collections that have been percolating for a while. 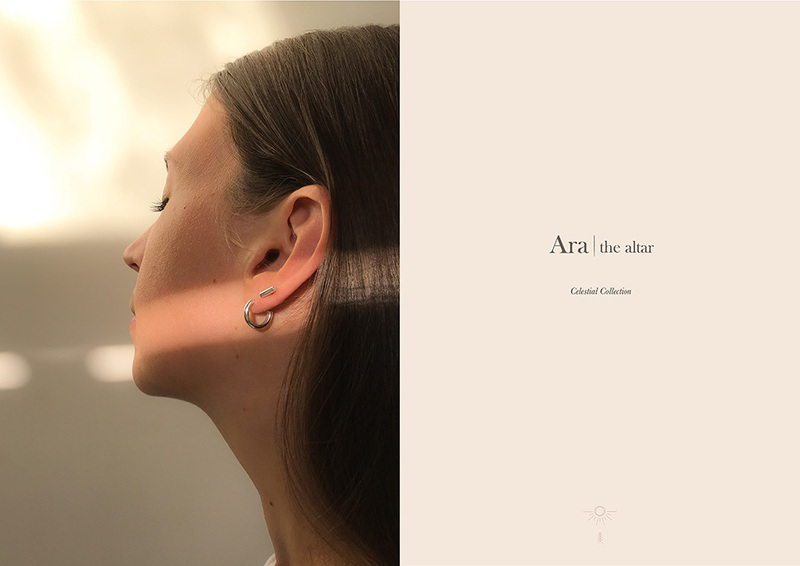 I would love for Ara the altar to become more widely accessible to individuals via select independent stores, in store as well as online, and looking further into the future there are a couple of plans that I look forward to sharing when the time comes! In the meantime, a monthly newsletter and a blog are just around the corner to give a little more insight into what goes on behind the brand, and to explore considered ways of living etc. to help me stay more connected with this lovely community. Last but not least, what are you grateful for at this very moment? This is such a great question. At this very moment, in conversation with you, I feel really grateful for the connection that Ara the altar has enabled me to have with so many wonderful and interesting like-minded individuals. I think it’s really powerful that our shared values have brought us together. Sadly, I can’t help but think too of the dreadful effects of the wildfires in California. I of course feel grateful for a safe space, for having the support of my partner and family around me. And I’m grateful for having the ability to see and hear things that bring me comfort and inspiration. And, ultimately I feel grateful that it is not yet too late for us to lessen our impact if we act on our convictions. This is such an important question to ask yourself. Personally, I find that exploring just a few thoughts of gratitude helps to reset my mind, so thank you, Krissie, for the reminder to make time for gratitude. Lauren, thank you so much for your beautiful and inspiring words!